Since my 2010 transplant, my new liver has given me a completely new life. Now, I volunteer at Baylor Medical Center to encourage transplant patients who are now traveling the same journey I have been through. I share my story in hopes that my experience and return to health will help encourage them and lift their spirits through what can be such a difficult time. I also volunteer with Southwest Transplant Alliance to help register more people to be organ, eye and tissue donors. My wife Judy and I promote organ donation everywhere we go. Judy was a contestant on the TV show “Let’s Make A Deal” and promoted organ donation on national television! Recently, I was featured in an article in a seniors magazine to help more seniors realize that there is no longer an age limit for donation and urge them to register. Through my participation in the U.S. and World Transplant Games, I have met so many wonderful transplant recipients, each with their own amazing stories. It is so special to see these organ recipients enjoying their lives and celebrating the gift of life. 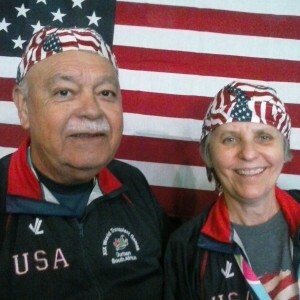 Judy and I have traveled to South Africa and Argentina for the World Transplant Games (the picture of us above was taken at the Argentina Games.) It is amazing to meet so many people from all over the World with one goal in mind: to raise awareness for organ donation. My personal goal is to continue to share my story to get as many people as possible to register to be organ donors. The more donors on the list, the more lives we can save!